God is in charge. He does what He wants, and everything He does flows from His character, which means it’s all holy, righteous and good, and nothing can happen without His permission and consent. People do make their own decisions and do what they want to do, and are rightly held accountable for them. Why did Satan torture Job? Well, because Satan wanted to do it. But, Satan could only act because God gave him permission (Job 1:6-12). In fact, Job’s author bluntly stated Yahweh had brought all this upon Job (Job 42:11). That is, Satan was only the secondary agent. Why was Jesus killed? Because the apostate Israelite leaders wanted Him dead, and they pressured a weak Roman governor into ordering the execution. But Luke tells us Jesus was “delivered up by the definite plan and foreknowledge of God” (Acts 2:23). Why did the Babylonians destroy the Kingdom of Judah? Well, because they wanted to! But, over and above even their own conscious understanding, God was directing and channeling their wickedness for His own purposes (see Habakkuk 1-2). God said He was raising up the Chaldeans, not the other way around (Hab 1:6). He did this work, not them (Hab 1:5). Why do false teachers come? Moses says God sent them: “for the Lord your God is testing you, to know whether you love the Lord your God with all your heart and with all your soul” (Deut 13:3). Yet, God still decrees that a false teacher must die “because he has taught rebellion against the Lord your God” (Deut 13:5). These false teachers did what they wanted to do, but over and above their own consciousness God had sent them to test and sift the people. Yet, they were still held morally responsible for their actions. Many examples of compatibilism are not didactic; they’re often stated matter-of-factly, without fanfare. Consider what Moses wrote about an Amorite King, Sihon. Why wouldn’t Sihon let the Israelites pass through his land? Well, Moses tells us why. The Lord had “hardened his spirit and made his heart obstinate” (Deut 2:30). God made it so Sihon wouldn’t listen. Why did God do this? Well, Moses wrote that God did this so “that he might give him into your hand, as he is this day” (Deut 2:30). God made Sihon not listen, because God wanted the Israelites to destroy him. Simple. Consider the covenant blessings and cursings; how could God carry them out if compatibilism wasn’t true? How could He scatter them among the nations (Deut 28:64)? The historical books tell us God used the Assyrians and Babylonians to do this, and they certainly weren’t conscious agents! How could Yahweh bring some of them back to Israel as slaves (Deut 28:68; see also 28:32) without employing unwitting, intermediate agents? How else could the Lord “cause you to be defeated before your enemies” (Deut 28:25)? The Israelites surely fought as best they could, but God gave their enemies the victory. Who will bring men to oppress and rob the Israelites continually (Deut 28:29)? Are these robbers remorseless robots; droids programmed by God to plunder the Israelites against their will? Hardly! Why will engaged young ladies be ravished by evil men (Deut 28:30)? Dare we assume those who commit these crimes aren’t also morally responsible for their wicked actions? Dare we lurch into the opposite ditch and assume God sat in heaven above as a helpless bystander? How can God bring a foreign nation to oppress and destroy them (Deut 28:33-34, 36-37)? If we look at the administration of human affairs with the eye of sense, we will have no doubt that, so far, they are placed at man’s disposal; but if we lend an ear to the many passages of Scripture which proclaim that even in these matters the minds of men are ruled by God, they will compel us to place human choice in subordination to his special influence. God works over and above our own personal will to accomplish what He wants. 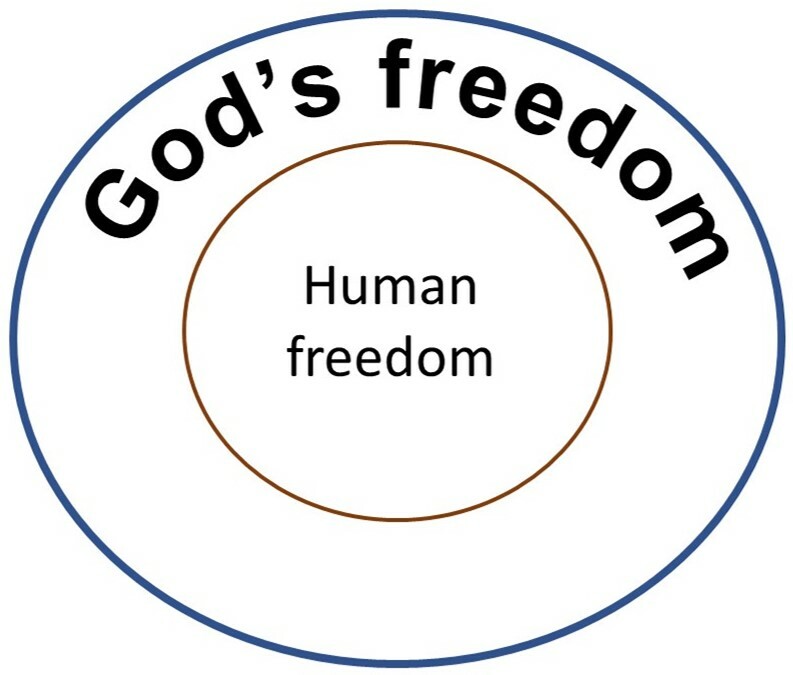 As the 1689 London Baptist Confession of Faith reads, “God, in his ordinary providence maketh use of means, yet is free to work without, above, and against them at his pleasure.”4 You make free choices. I make free choices. We all make free choices. Yet, above our own consciousness, our holy and righteous God is working all things according to the counsel of His own will. As Solomon said, “The king’s heart is a stream of water in the hand of the Lord; he turns it wherever he will” (Prov 21:1). We do not wish to inquire with undue curiosity into what he does that surpasses human understanding and is beyond our ability to comprehend. But in all humility and reverence we adore the just judgments of God, which are hidden from us, being content to be Christ’s disciples, so as to learn only what he shows us in his Word, without going beyond those limits. This doctrine gives us unspeakable comfort since it teaches us that nothing can happen to us by chance but only by the arrangement of our gracious heavenly Father. He watches over us with fatherly care, keeping all creatures under his control, so that not one of the hairs on our heads (for they are all numbered) nor even a little bird can fall to the ground without the will of our Father. 1 If you want to read a great book on this topic, you should pick up a copy of Evangelism and the Sovereignty of God, by J.I. Packer. I reviewed the book here. 2 The following excerpts are from John Calvin, Institutes of the Christian Religion, trans. Henry Beveridge (Peabody: Hendrickson, 2012), 2.4.6. 3 I adapted this graphic from Michael Horton, The Christian Faith: A Systematic Theology for Pilgrims on the Way (Grand Rapids: Zondervan, 2011), 261. 4 1689 London Baptist Confession of Faith, 5.3. 5 1618 Belgic Confession, Article 13. So true, such a comfort. I'll have to read this again slower to see if I can find something to disagree with. When you pull all those passages close together like that the synthesis packs quite a bunch. For me, the best proof of God's sovereignty is reading the OT. It's all there. Tyler, this is a very helpful treatment of a challenging subject. Thanks for putting these thoughts and texts together in such an insightful manner.